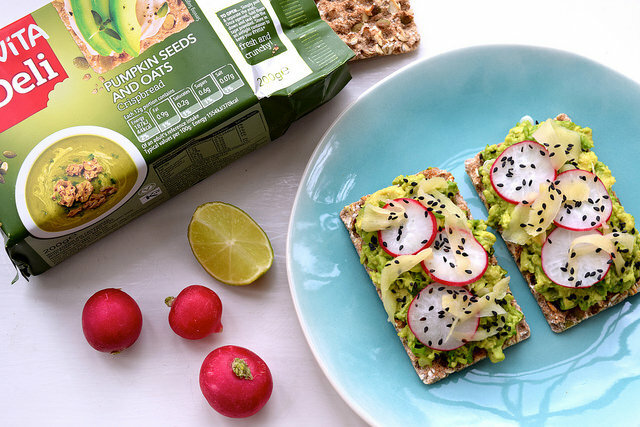 Today marks the beginning of a month long partnership over on my Instagram where I will be showcasing some of my favourite ways to top Ryvita crispbreads as part of their #MyVita campaign. 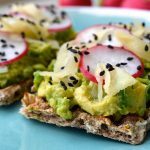 I’ll be sharing a few quick and easy breakfast, lunch or snack time ideas for a delicious (and actually quite good for you) bite. 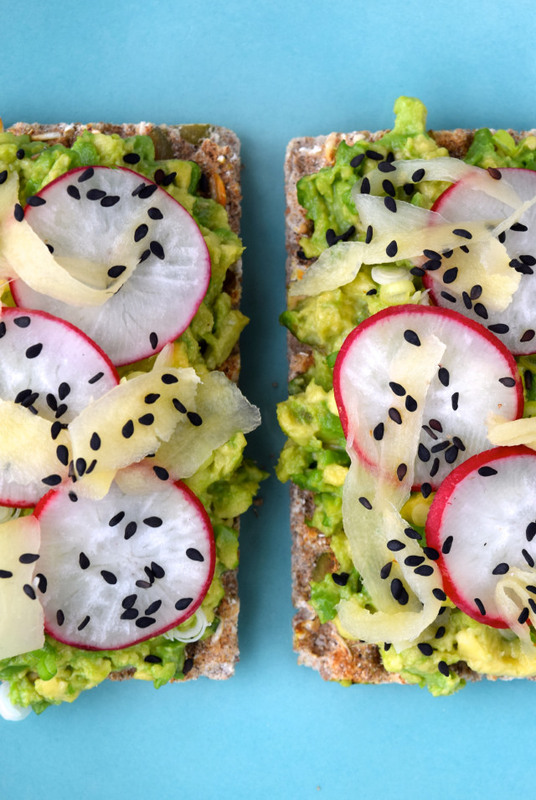 However, while we like out Instagrams in digestible chunks, for this blog post I thought I’d share something a little more involved: an Asian twist on everyones favourite avocado toast, complete with homemade sushi ginger. Before we move onto talking about the crispbreads (a relatively new, but already much loved addition to our larder) can we take a moment to discuss the homemade sushi ginger? I‘ve already waxed lyrical about my new favourite cookbook (which I am working through at the rate of knots), Simply Nigella, so it is pretty obvious from those of you who own the book that I got the idea to make my own sushi ginger from it. From the first time I made it I marked it as one of the most life changing recipes (if you can even call it that) to come through my kitchen ever (seriously, we’re in 3-Step Brownie territory here), and I’ve always made sure there is a jar in the fridge to throw onto everything from Asian mackerel and rice bowls to salads and of course, avocado toast when the mood strikes. I’ve adapted the recipe a bit from Nigella’s version because let us be honest, not everyone owns exactly the same size and volume preserving jars as Nigella, and not all of us have the patience to sit there and peel that much ginger. So take my recipe as more of a guide which should help you make sushi ginger anywhere, and any how. I promise you it so much better than the stuff you can buy in the supermarket or Asian grocery. So, onto the crispbreads. 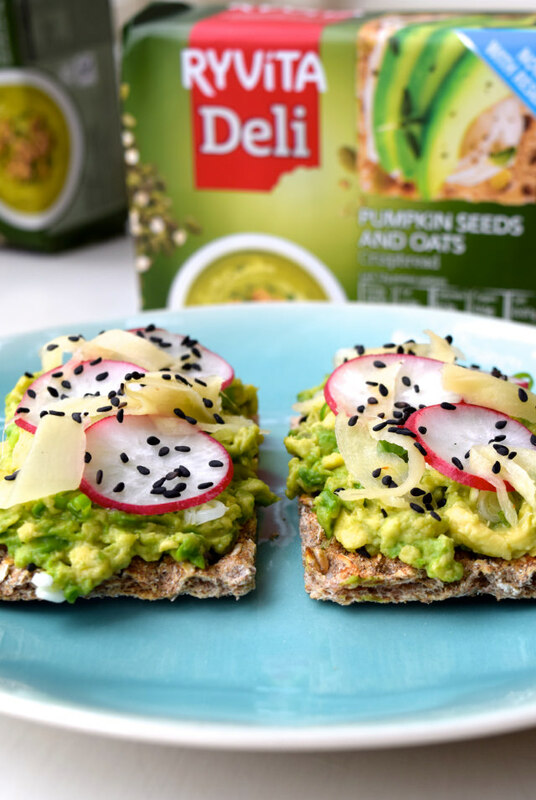 I’ve chosen to use the oat and pumpkin seed variety for this recipe (mainly because I sometimes scatter my avocado toast with pumpkin seeds), and it works beautifully for either a savoury breakfast or for a light lunch. 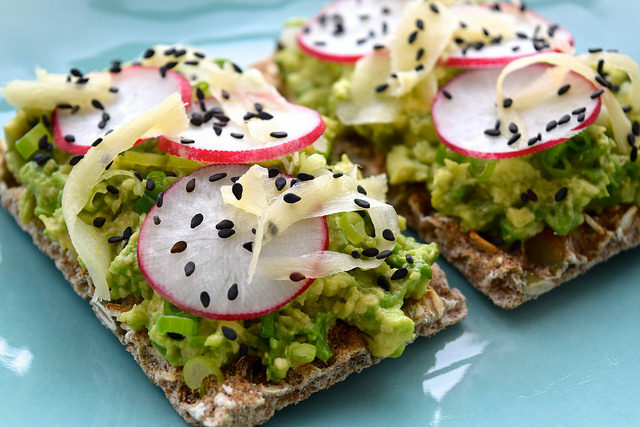 Perhaps with the slight exception of the sugar in the pickling liquid in the sushi ginger (though, by making your own you’re cutting out any of the artificial preservative or colouring badness they might have added), these crispbreads are also pretty great for you too. These crispbreads only have 0.6g of sugar per portion (my Mother is reading one of those ‘sugar is evil’ books right now, and she’s been reading the sugar content out off the back of practically every food item that enters our kitchen), and by virtue of them being made out of rye, they’re full of things like magnesium and zinc, which I personally wish everything was full of because it helps you get nice shiny hair, strong nails and clear skin. 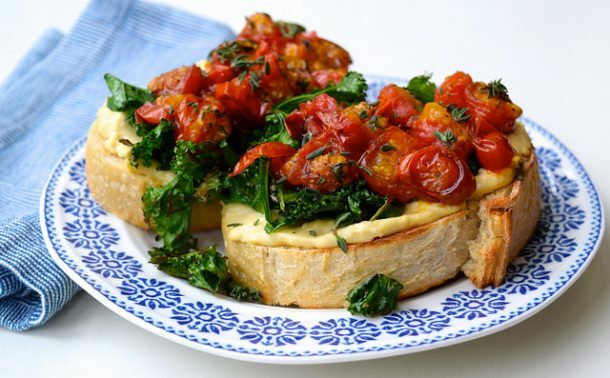 But all that aside, they taste good and make me feel a whole lot better about what I’m eating which I don’t get from a slice of white bread toast from the freezer. I’m just coming off of the back of a big recipe project where while everything has still been almost 100% homemade, I’ve not been on my usual diet of not much meat and lots and lots of vegetables. I’ve started to feel the effects just a bit, and this recipe is just the start of getting back to normal. 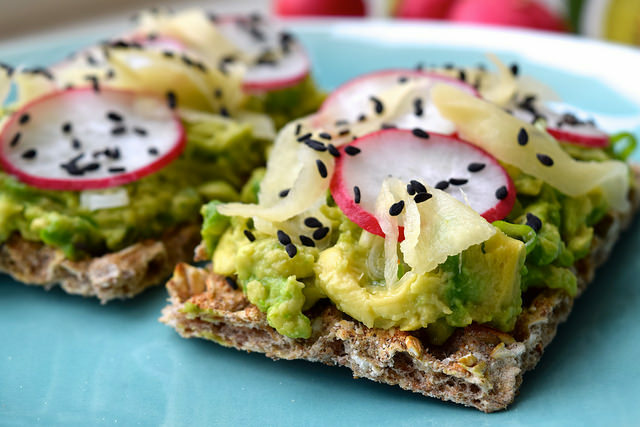 This delicious, Asian inspired alternative to avocado toast is taken to the next level with homemade sushi ginger. First, make the sushi ginger. 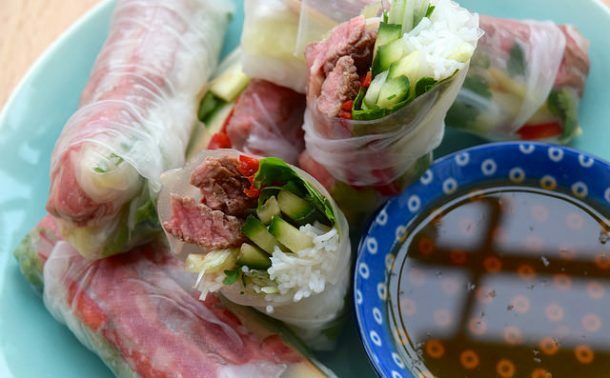 You’ll want to let it pickle in the fridge for at least 24 hours before you eat it. You’ll want to make it in one of those mini jam jars that are not quite as little as the ones you get on hotel breakfast buffets, but not quite half the size of a regular jam jar. Whatever you’ve got with a lid that seals and is about this size is fine. Using a vegetable peeler, peel the ginger, then slice it into ribbons. Carry on doing this until a) you fill up your jar, b) you run out of ginger, c) you get bored of peeling, or d) any combination of above. Place the ginger ribbons in a small bowl mixed together with the salt, and set aside. In a small saucepan, place 30ml of rice vinegar and the 30ml of water together with the sugar. Set over a low heat and stir until all of the sugar has dissolved. Set aside. Over the kitchen sink, squeeze as much excess liquid from the ginger and add it to your jar. Pour over the pickling liquid, and top up the jar to the top with more rice vinegar. Wait until the liquid has cooled before screwing on the lid, and stashing it in the fridge until it is ready for you to pair with absolutely everything even vaguely of an Asian persuasion you can think of. To make the flatbreads, peel and mash the avocado in a small bowl, until it is smooth enough to spread but still has a good few chunks. 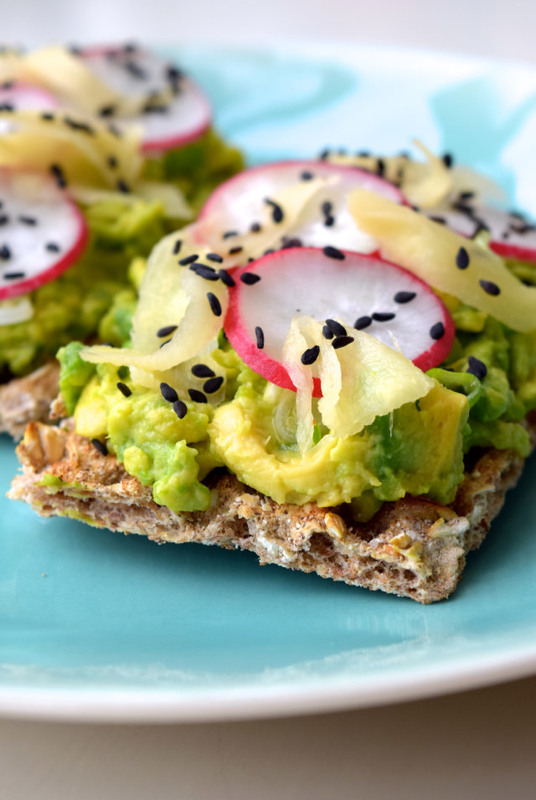 Spread the crispbreads with the avocado, and sprinkle with a bit of sea salt and season with a few good squeezes of fresh lime juice. Thinly slice the spring onion and radish, and scatter the slices on top. 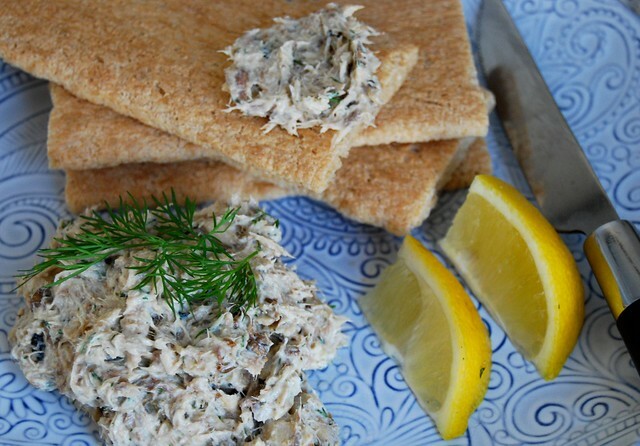 Drape a generous few pieces of sushi ginger over the top of each crispbread, and finish with a good scattering of black sesame seeds before enjoying immediately. As I said, if you keep an eye on my Instagram this month and follow the #MyVita hashtag and @RyvitaUK on Instagram, you’ll find a whole world of different topping ideas to up your lunch game. Also, if you share your own Ryvita toppings and recipes on Instagram, Twitter or Facebook with the #MyVita hashtag your recipes will appear on the Ryvita website, and be entered in a draw to win either £1,000 spending money, or a £1,000 foodie trip to Paris. The competition runs for a month from today, and be sure to also tag me (@missrachelphipps on Instagram and @makingmewonder on Twitter) so I can enjoy your creations too!